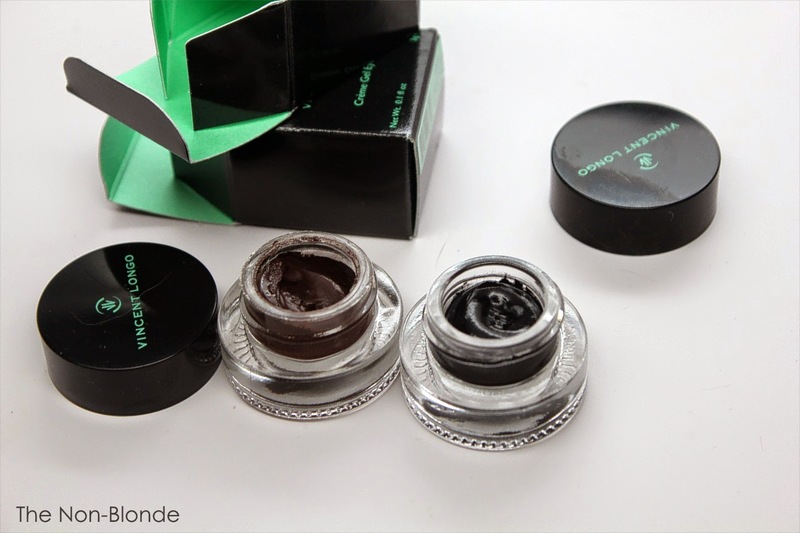 I'm already a convert to Vincent Longo's wonderful Crème Gel Eyeliner, a versatile gel eyeliner (thank you, Lady Obvious) that can be smudged as an eye shadow and when set does not budge no matter what you throw at it (other than an oil-based or a dual-phase eye makeup remover). The two next colors I was sent are more traditional eyelinery: Felis Brown is a dark chocolate brown, while Blu Raven is a glossy blue-black kind of thing. It's so black, actually, that I don't think it fits into my favorite category of "not-quite-black", but it does have a blue tinge in a certain light (I did my best to capture it), so I guess that's what counts. 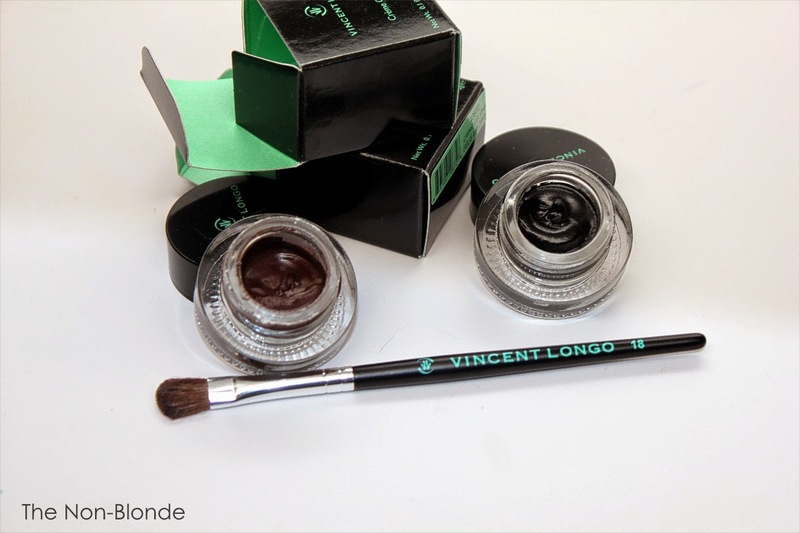 Like the other Vincent Longo Crème Gel Eyeliner I've tried, the texture of this product is almost fluffy, perfectly consistent and very easy to work with. 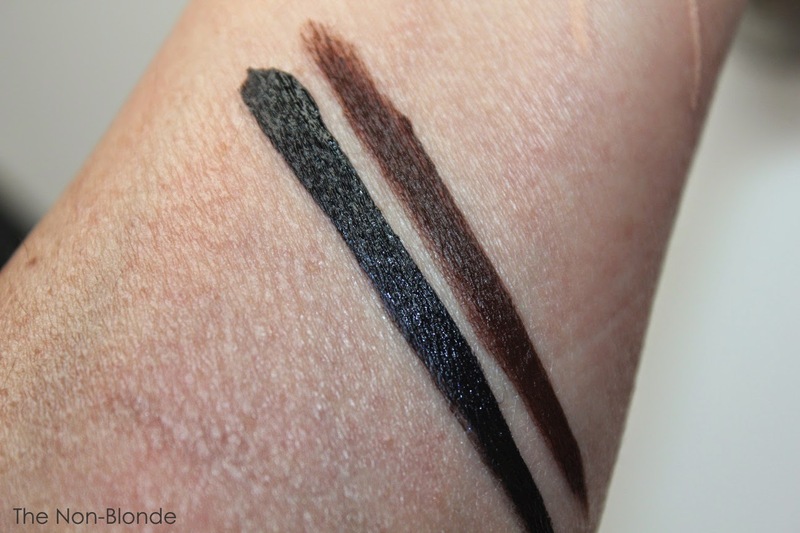 You can get as thin a line as you want, or apply it like an eye shadow (seen above is Vincent Longo Small Eye Shadow #18 which I used for the swatches). Longevity and performance are a perfect 10 in my book, so once again I'm hoping for a true blue (and dark teal, and gray, and...). Vincent Longo Crème Gel Eyeliner in Blu Raven & Felis Brown ($25 each) are available from Nordstrom and vincentlongo.com. The products in this review were sent by PR. Very interesting that blue leaning on the almost black eyeliner. I would love such a colour with an aqua eye! Have you ever thought of linking to the product in your posts (affiliate links or not)? I know I can just Google it myself, but clicking on an imbedded link is so much easier (yes, I am that lazy...). Squirrely, I don't link to the products exactly because of the affiliate links issue. I don't use them and don't want to cause the impression/confusion that I do. I try to always give the URL of the store where the product is available, so it's only a matter of c/p and a few clicks.